Let’s say you are going to a friend’s house, and you expect it to take about an hour to get there. In your city; however, traffic is known to cause delays. If a traffic jam occurs, it will impact your arrival time. You’ve informed your friend about the possibility of delay—say by 20 to 30 minutes, but the “reverse” scenario could also occur. With typical traffic, you will reach your friend’s home on time, and you will not need to use the 20 to 30 minutes. In this example, you have identified the risk (i.e. traffic conditions). It is a known risk, but the impact on your travel time is unknown. You could call this a known-unknown risk. You have not only identified the risk, but accepted it, and proactively added a reserve time to your estimated travel. If you get into bad traffic, this reserve will be consumed. Project management is similar. We have reserves for our estimates (time estimates or cost estimates). Estimates are many times expressed in ranges, such as rough order of magnitude (ROM) estimate, budgetary estimate, definitive estimate, etc. By definition, estimates are always uncertain. Ranges indicate the degrees of risk. To address these risks, we use buffers or reserves. Typically, these are contingency reserve and management reserve. If you are preparing for the Project Management Institute® Risk Management Professional (PMI-RMP)® or Project Management Professional (PMP)® examinations, you must be familiar with these two reserves. Contingency reserve is allocated for an activity, work package, or a project. It is applicable to both time and cost estimates, which can lead to individual project risks. Contingency Reserve is also applicable to the overall project when overall project risk is concerned (i.e. chances of meeting a project end date or meeting the cost target). It is sometimes referred to as contingency allowance when you consider cost estimates, or schedule reserve when you consider time estimates. Now, you might be wondering when you would use such a reserve. A project is always executed in an uncertain environment, leading to many risks. It is unlikely that you can address all possible risks and have risk responses for all of them. In fact, for some risks, you just cannot do anything. You have to accept them. Let’s consider an example. You know some deliverables in your project may require rework because of defects, issues, or bugs, but do you know the amount of rework needed? This is a known-unknown. Another example is this: resource churns will happen in any project. New resources will join the project, and/or old resources may leave. Do you know when a team member might decide to leave, or what impact it will have on the project? Here again, we have a known-unknown. For such risks, there is nothing to do but actively accept the possibility of the occurrence. What you CAN do is assign a buffer or reserve—a contingency reserve. Let’s consider another scenario to understand this type of reserve. In your project, there will be some risks which will be unknown (or unidentified) when you begin. For example, a sudden increase in material prices due to economic turbulence. Do you know about that risks in advance of the project? Of course not. You also do not know what the impact will be. These types of risks are hard to predict, so impact is also unknown. For such unknown-unknown risks, we have management reserve. A significant point to note is that contingency reserve is within the baseline, whereas management reserve is not. Contingency reserve is known to the project manager and visible to all (It can be cut down, as well! ), but management reserve is outside of the approved baseline. To use management reserve, as the manager of your project, you will likely be needing approval. Approval follows the change control process. If you use the reserve, then, of course, the baseline also has to be updated. You may be wondering about the protocols of using these reserves? Such procedure should be documented as part of your “Risk Management Plan.” It can be created by you or dedicated by risk managers, who will be a part of larger, more complex, and/or strategically important projects. Both contingency and management reserves are shown in the block diagram below. The contingency reserve can be applied at the activity level, the work package level, or overall project level for overall project risk. If you have activity contingency reserves, they will get rolled-up in the work packages. Work packages with contingency reserves get rolled to control accounts. The control accounts, having the work packages and planning packages, then roll-up to form the cost baseline of the project. Within the cost baseline, you also have the overall project contingency reserve. The cost baseline is part of the integrated baseline (i.e. the performance measurement baseline or PMB), against which the project performance is measured. The PMB is an integrated baseline for scope, schedule, and cost. On top of the baseline, we add the management reserve to determine the budget or total allocated budget (TAB) of the project. Because the cost baseline is an approved version of the time-phased project budget, it can and is depicted many times with an S-curve. S-curve analysis is frequently used while conducting earned value management/analysis (EVM/EVA). In the below figure, we have 3 curves – planned value (PV) curve, earned value (EV) curve, and the actual cost (AC) curve. The end of the PV curve is the budget at completion (BAC), which is the cost baseline. The end of the AC curve is the estimate at completion (EAC). PV, EV, AC, BAC, and EAC are earned value management related metrics. The contingency reserve is within the baseline (below the BAC). In other words, you can say it is part of the performance measurement baseline (PMB). For easier understanding, I’ve shown the contingency reserve as a lumpsum amount at the overall project level for both individual project risk and overall project risk. On the other end, the management reserve is beyond the baseline (below the BAC or above the PMB line). Earlier, I noted that contingency reserve can be calculated with quantitative analysis. You would make this calculation to have a desired level of confidence in meeting the project objectives (i.e. schedule objective or cost objective). The contingency reserve is determined many times with Monte Carlo analysis on the quantitative risk model of the project. The output of this analysis can be a cumulative probability distribution curve—an S-curve with the probability of achieving our target objective(s). The S-curve in the following example is a variant of the S-curve shown earlier, and is many times called as risk-adjusted S-curve. In the earlier figure, the shape is shown as an S-curve, because of cumulative cost values. A risk adjusted S-curve forms a similar shape, but with scale for probability in the Y-axis, instead of cost. Cost (or duration) can be shown in the X-axis. Let’s analyze the figure. In the Y-axis, we have the probability, whereas cumulative cost is shown in the X-axis. The deterministic value for our initial planned cost is $12.72M, which has a probability of 23%. Look at the portion highlighted in yellow with notation next to the end of arrow mark. Now, that’s a very low chance! For a 100% chance, we need a budget in excess of $15M, but what about the contingency reserve for 80% probability? To have THIS level of confidence, we need a budget of 13.84M. We see that highlighted in orange with notation next to the end of arrow mark. We can conclude that for this project a contingency reserve of $1.12M, will result in 80% confidence of meeting the target cost. If you want to reduce the contingency reserve, you have to go with a lower chance. If you want to have a higher chance, the contingency reserve, of course, will go up. In other words, the amount for contingency reserve will be based on the confidence level needed. A new aspect of risk management that has been introduced in PMBOK 6th edition is the concept of emergent risks. Unlike known-unknown risks or unknown-unknown risks, emergent risks are for unknowable-unknowns. These are risks which can only be known after they have occurred. Unknowable-unknowns exist many times within projects using disruptive technologies or creating products or a market which has never existed before. For disruptive technologies, the market application does not exist, hence can’t be analyzed (it is unknowable). The amount of work needed also can’t be determined (it is unknown). Projects employing disrupting technologies can have emergent risks. These are addressed by project resilience. To have project resilience, one important part is to allocate proper contingency reserve for both schedule and budget. This contingency reserve is separate from the contingency reserve added for known-unknowns. To help you quickly remember contingency and management reserves, I’ve outlined the differences in the table below. It addresses Known-Unknowns (i.e. covers unknown amount of rework within the scope of the project). It also addresses the unknowable-unknowns. It addresses Unknown-Unknowns (i.e., covers unknown unforeseen work within the scope of the project). It is part of the Cost Baseline or Schedule Baseline. It is not part of Cost Baseline or Schedule Baseline. Use of contingency reserve doesn’t change the cost baseline. Use of management reserve may change the baseline. Approval is needed for it. It is known to the Project Manager. Usually not known to the Project Manager (can be known and managed at the program level/senior management or known to the sponsor). It can be a percentage of the estimated duration or cost, a fixed number, or can be developed with quantitative analysis techniques. This reserve can be a percentage of the proposed budget/schedule or a fixed number. It can’t be developed with quantitative analysis techniques because it is for unknown risks. Organizations typically have around 3% to 5% budget as contingency reserve. Organizations typically have around 5% to 8% (sometimes 10% to 12% budget) as management reserve. Known risks, which cannot be managed proactively, should be assigned a contingency reserve. A contingency or mitigation response is developed for these known risks. Unknown risks which cannot be managed proactively should be assigned a management reserve. Can be used in “Accept” risk response strategy (i.e. active acceptance of risks). Used for management control purposes and not directly used as part of active risk acceptance. If the known or identified negative risks don’t occur, the contingency reserve is removed. No such case here, because to use management reserve, explicit approval is needed. I really liked this article and your treatment of the subject. However, I guess I don’t appreciate the distinction between unknown-unknowns and unknowable-unknowns; it seems needlessly complicated to create a separate class of contingency reserve to serve the same purpose as management reserve. Thank you Eric for the comment. Let me know your thoughts. Why you think that unknowable-unknowns should be addressed by management reserve? If Earned Value Management is used for the project, having contingency reserves at the activity or work package level results in a virtual rubber baseline since most contingencies would not be involved. Since the contingency reserve is a component of the PMB then any time the contingency is not invoked requires a re-baselining. Otherwise, the amount for the contingency contained in the work package would result in a masking of the project performance and inflation of the overall project cost estimate. A serious logic flaw. The only scenario that is logical relative to EVM is CR at the project level. A 2000 paper by Christensen and Templin titled “AN ANALYSIS OF MANAGEMENT RESERVE BUDGET ON DEFENSE ACQUISITION CONTRACTS” is a much better discussion on the topic of management reserves and contingency reserves. Supplementing Sayta, A) for risk events, a contingency to absorb delays can be implemented by a lag on the successor of the task before the delivery task. At least use the longest delay of any remaining risk. For risks that can recur, such as departure of another key resource, compress the schedule to rebuild the contingency, if a departure has occurred. This aggregate risk contingency can be calculated by spreadsheet DPRODUCT ( database product) if the risk register provides the likely delay and post-mitigation likelihood of each risk happening (see my 2013 PMI Scheduling Conference, “Risk Contingency Analytic Method”). To have a risk register and to not have an aggregate risk contingency would be inconsistent. It would mean the schedule is proceeding as if there were no risks. B) After implementing the risk contingency, add a buffer to absorb estimating uncertainty. To assure product delivery no later than its committed date, the task before delivery needs to have a planned Finish date leaving a buffer in time. Furthermore, the ratio between high and median estimates shows the degree of uncertainty, which should be relatively consistent through out the schedule and adjusted as the project passes through discovery and proceeds to produce its results. Using the Critical Chain method, manage the project using median estimates and according to buffer penetration – 1/3 penetration: plan buffer recovery; 2/3 penetration, restore the buffer then appropriate. 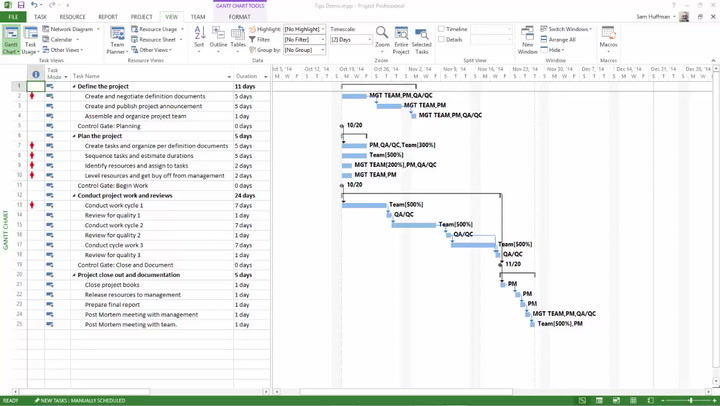 As the project tasks complete above and below median estimates, the date of the last task before the product delivery task shifts forth and back. The buffer needs to be compressible. It can be implemented by setting a constraint (Start No Earlier Than) on the delivery task. To have Total Slack show the critical path, on the task before the delivery task, enter a deadline set to it’s planned Finish date. Else, the buffer would make the tasks of the schedule non-critical. Since the aggregate risk contingency is implemented by a lag and the project buffer is implemented by a constraint, to avoid double counting risk effects, range estimates should exclude allowance for risk events. To schedule a project without risk and uncertainty shock absorbers almost guarantees a late product delivery or a need for resource heroics, descoping, under testing, etc. You didn’t inform on why you think unknowable-unknown should be addressed by management reserve? Now, it is totally different direction. Another set of observations with quote from a paper. I can quote 100s of paper with conflicting opinions. The focus of the article is what PMI is saying and how it will help PMP or RMP aspirants. So contingency reserve can exist at an an activity level or work package level or at the project level. Contingency is also informed to be for emergent risks. Critical Chain Method (CCM) has been completely removed from the PMBOK Guide 6th edition. So, buffer and buffer management with other related areas to CCM are not relevant to this article. Satya – I don’t believe PMI addressed contingency reserve (CR) in relation to EVM anywhere in the PMBOK. It is discussed in the EVM Practice Standard, 2nd edition. The CR, per the EVM P/S, is at the project level housed in Undistributed Budget. Ideally, a separate category for CR should exists that is a component of the PMB. Until that time, the EVM P/S recommends that CR be housed in Undistributed Budget (UB) which is within the PMB but at the project level. The main point which you did not address is that having CR at the work package level results in a near constant need to re-baseline, since most contingencies will not be invoked in the project. If you allocate CR to the work package budget, how do you deal with contingencies and their associated budgets that are not invoked in the context of EVM? Also, how do you create your PMB if you have budget for all possible contingencies? It would result in an overly inflated PMB to have budget within the work package for contingencies. You need to think this through rather than just quote a passage from the PMBOK that isn’t addressing the situation with regards to EVM application. If you still think that CR should or could be housed at the work package level, then I’d be curious to see your response to the question I posed above.